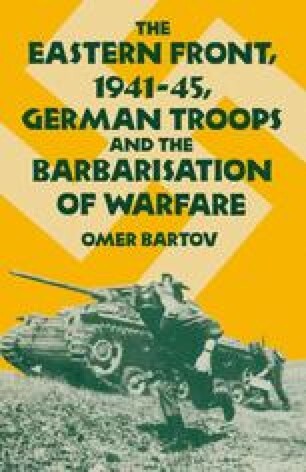 The main question posed by this study is what were the causes of the barbarisation of German troops on the Eastern Front during the Second World War? More specifically, this book is an attempt to examine the relationship between the conditions at the front, the social and educational background of the junior officers and political indoctrination on the one hand, and the criminal activities of the army in the East on the other hand. That a research of this kind is necessary, both from the factual and the methodological points of view, can be demonstrated by a brief survey of the available literature dealing with these issues.